If you used to think that obnoxiously smug confidence was the sole territory of Republicans and freshman philosophy majors, think again. 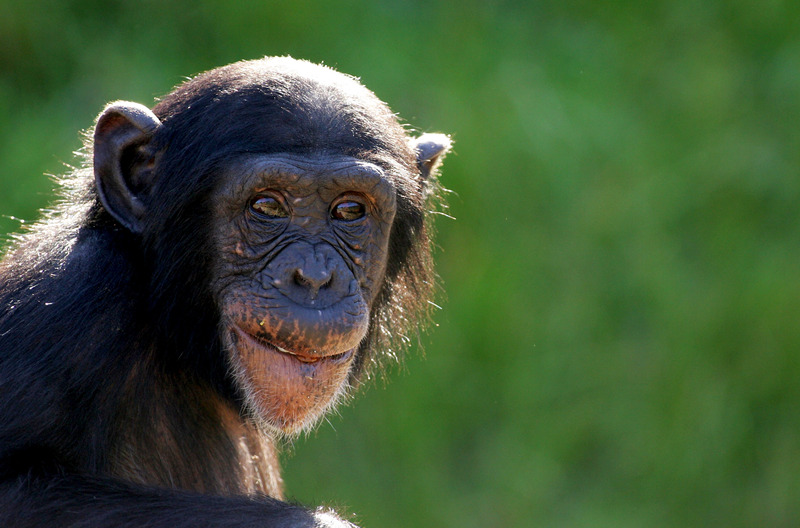 According to a recent study, chimpanzees display confidence just like humans. Researchers from Agnes Scott College and Georgia State University teamed up to analyze the animals' metacognition, a type of higher order thinking generally attributed to humans. Now, I don't want to be alarmist, but the results showed that maybe a Planet of the Apes- style animal uprising isn't too far off the mark. OK, maybe that was a little alarmist. Chimpanzees may be extremely intelligent, but they're not going to lead a revolution against humanity anytime soon....I think. All jokes aside, the study indicates that chimpanzees could share human capacity for metacognition. According to the Daily Mail, the subjects of the study were given computerized memory tests. After a small delay, the results of the tests were relayed to the chimp, and if the chimp was right, he or she received a food reward. It's simple enough, but there was a catch. The reward was removed after a short period of time, so the chimps had two options: Wait to find out whether they were right, which forced them to hurry for the reward, or start moving before finding out for sure whether they answered correctly. The action wasn't up to chance, either; researchers found that the subjects were much more likely to move toward the reward early when they were correct. Researchers interpreted choosing the head start as a sign of confidence. "They did not have to [take the head start]," researcher Audrey Parrish told the Daily Mail. This study joins several others showing that chimpanzees share many characteristics with humans, from heritable intelligence to the ability to cook food. If you suddenly feel weird about all the chimpanzee exhibits in zoos around the world, trust me. You're not the only one. In the meantime, while you're quietly dealing with your crushing guilt, researchers hope to run tests on non-primate animals and further analyze the factors that affect chimpanzees' confidence. Presumably, unlike humans, these factors don't include being haunted by middle school bullying and that time your sister hesitated too long when you asked if you looked fat, but who knows? Stranger things have happened.